“I've said this two years ago and I'll say this again -- ‘AAA’ stands for Army, Army, Army,” said RM. 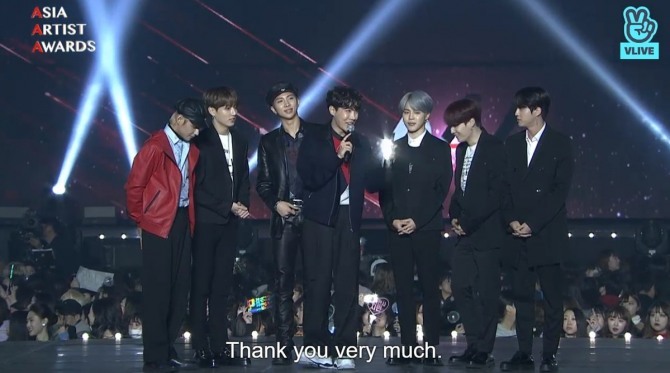 BTS won the grand prize at the 2018 Asia Artist Awards on Wednesday, succeeding last year’s recipient, EXO. In the pre-ceremony voting, which closed on Nov. 20, BTS trumped EXO by a slim margin of 1.1 percent, or 246,371 votes. The former earned 23.9 percent or 5,400,798 votes and the latter 22.8 percent, or 5,154,427 votes. The voting and social media big data analysis made up the two award criteria. The group expressed their heartfelt gratitude to fans, known collectively as Army, for the honor. “This year made me realize once again how lucky I am to be with my bandmates, and our fans -- Army.” Jimin said during the band’s thank you speech. The septet staged two of its Billboard-charting songs “Idol” and “Fake Love” at Wednesday’s event. This year marked BTS’ third time at the awards show, as the group has attended every one of its ceremonies since its inception in 2016. Launched by the business-focused media outlet Money Today, the Asia Artist Awards is South Korea’s first awards ceremony to cover the music, television and film industries.